There Are Tons Of Ways You Could Do This! Welcome back to myelectricknifesharpener! Today’s post is a little different than usual. Instead of telling you the right way to do things, I am gonna do the exact opposite. If you want to know how to dull a knife, just follow this post to a tee! Although, I hope you don’t! Remember, a well cared for knife is not only sharp and easy to work with, but it’s also much safer than a dull knife. I’ll be talking about 5 ways on how to dull a knife, but really there’s a lot more than these 5. You don’t require a tremendous amount of effort to blunt an edge. This is by far one of the biggest reasons people end up with a dull blade. Most people don’t realize the implications of cutting against a hard surface, so they continue doing it. But here’s the problem: every time you cut down or against a hard surface, you could potentially cause your knife edge to fold, or become misaligned. You’re probably wondering what I mean by hard surfaces, right? I’d categorize a hard surface as anything that is harder than the steel your knife is made of. To simplify things, what I am really talking about is cutting boards and plates. Glass and ceramic cutting boards will look good, but that’s it! Unless you want to ruin your knives, you should stay far far away from them. Well, what about glass and ceramic dinnerware…..are you suggesting that I should use wood or plastic!? No, that’s not at all what you should do. All I am suggesting is that you refrain from prepping food and cutting meats or vegetables on a glass/ceramic plate! Sounds ridiculous? Well it’s not. I know of many people who can’t be bothered to pull out their wooden or plastic cutting board to do the task. 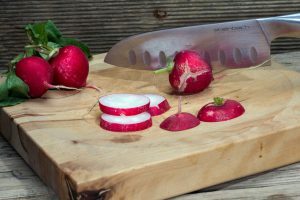 Using A Good, Soft Cutting Board Will Ensure Your Knives Stay Sharp For Long! #2 Knives Require Regular Maintenance! One of the quickest ways on how to dull a knife is by failing to maintain it regularly. Knives are not the same as spoons or forks, and it’s about time people realize this. A knife is a special tool that always needs to be in tip top condition. If it’s not, then your life not only becomes a lot harder in the kitchen, but you also can’t prepare ingredients the way you’d like. So what exactly constitutes regular maintenance? One word: honing. I can’t begin to overstate the importance of honing. It serves to correct a misaligned edge, and keeps your knife going for that much more time without needing to be sharpened. And the best part? It’s really easy once you get the hang of it, and it only takes a couple of minutes. Here’s a full step by step guide on how to properly hone. Make it part of your routine and reap the benefits! Not all knives are the same. Each one has it’s own specific use, and you should not take this for granted. Yes, some knives are versatile and can be used for different things, but it’s not the case every time. What am I getting at? You should always strive to use the right knife for the job. Let’s consider an example to really drill it home: You’re tasked with preparing a whole chicken for dinner tonight, including deboning, dismembering, and cutting it up. And you have 2 tools to choose from to complete this task: a sheep’s foot paring knife or a boning knife. If you’re familiar with prepping chicken, the answer will be blatantly obvious. The correct answer is to use the boning knife, as it’s designed to make precise cuts for removing meats. But what if you used the sheep’s foot? You’d probably have some success, but it won’t be nearly as easy as if you used a traditional boning knife. And more importantly, you may have unintentionally discovered how to dull a knife by using it incorrectly. This isn’t an exaggeration! Understanding the different blade styles and what they’re used for is something everyone using a knife should know. #4 Knives Are Not Dishwasher Friendly! Knives in dishwashers are a complete no-no! Even if the manufacturers say it’s okay to do so, I still wouldn’t put my blades in a dishwasher. If you want to know not only how to dull a knife, but to also damage and cause it to rust, then try placing it in a dishwasher. The presence of water and air means you have a high possibility of rust formation. Rust can be a huge pain in the rear and if not treated in time, can spread and destroy your blade. Having said that, I would recommend you clean your knives under lukewarm water for a couple minutes, and completely towel dry before storing in a cool dry place. Below is a video explaining why you should never put your knives in a dishwasher (all credit to ExpertVillage). Sharpening, if done correctly is the process of transforming a dull edge to a sharp one. But what happens if it’s done incorrectly? If done with improper technique or with a bad sharpener, you risk not only having a dull edge, but possibly a damaged one too. Unfortunately not all knife sharpeners are good. In fact, many are actually pretty bad and do far from sharpening your knife. I’ve had some that have nicked, chipped and scratched some of my finest blades. Since this isn’t a post on sharpening, I won’t ramble on too much. What I will say is this: If you’re looking for an electric or pull through sharpener, do your homework and find the one that best suits your needs and sharpening requirements. Check to see that both your knife and sharpener will be compatible. If you’re going the route of using stones, practice on a throw away knife instead of wrecking your expensive ones. Watch a few tutorials on technique and try to practice as much as you can. 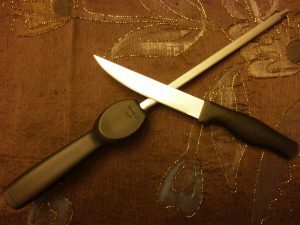 How To Dull A Knife: What’s Your Take? The above 5 ways are the most common on how to dull a knife edge, in my opinion. What are some other things that blunt your edge? Please share your experiences with all of us by dropping a comment and letting us know! I hope you enjoyed reading this post, and if you did a share would be appreciated. Until next time, have a splendid weekend!